Hudson — Award-winning author of the children’s book “Ella Enchanted” will visit Hudson library April 25 at 2 p.m. In celebration of its 10-year anniversary on Library Street, the Hudson Library and Historical Society will feature author Gail Carson Levine, who will discuss her new book “Stolen Magic,” to be released April 21, as well as the writing process and her experiences as a successful author. In “Stolen Magic,” Elodie, dragon detective Meenore and kindly ogre Count Jonty Um travel to Elodie’s Home island of Lahnt. Replica, a statue preventing the island’s deadly volcano from erupting, has been stolen and must be found in three days to save everyone. Elodie must use her wits to unravel a web of lies to discover who is guilty. “Stolen Magic” is the sequel to “A Tale of Two Characters,” which is based on the fairy tale “Puss in Boots,” Levine said. Levine’s first book for children, “Ella Enchanted,” was selected as a Newbery Honor Book and later made into a feature film starring Anne Hathaway. The Hudson library will show the film, “Ella Enchanted,” on April 22 at 4:30 p.m. in preparation for Levine’s appearance. She also has garnered praise for her New York Times bestseller “Fairest,” which was a Best Book of the Year for Publishers Weekly and School Library Journal; “Dave at Night,” an ALA Notable Book and Best Book for Young Adults; six Princess Tales books and many others. Levine creates fantasy worlds with fairy godmothers, gnomes, jealous queens and magic mirrors. “I love to invent magical creatures,” she said. Her stories discuss topics relevant to all ages, including self-acceptance, bravery and love. She teaches creative writing to students when she finds the time. In teaching adults and children, Levine emphasized not being “over-critical” and to be specific in improvement. “This spot needs more tension; this bit of dialogue could be more natural; the setting isn’t developed enough in Chapter One,” she explained. Levine, who received rejection notices for nine years, said she writes a few hours each day and writes wherever she can. Patience is a quality writers need most, she said. Books take a long time to write. “Sometimes we get stuck and have to work out the kinks, which refuse to be rushed,” Levine said. Her books have given Levine travel opportunities to Japan, China, Taiwan, Thailand, Australia, Mexico, Canada and Europe. “When I’ve been somewhere as an author, I come back with fresh insight,” she said. Levine said she knew she was successful when she visited her old New York City neighborhood two years ago and stopped at the public library, where she had borrowed hundred of books and paid late fines. Jennifer Chiaverini will visit the Hudson library March 8 at 2 p.m. In “Mrs. Grant and Madame Jule” the book focuses on the relationship between Julia Grant, a Missouri belle and her slave, Jule. Together for 37 years, Jule remained a slave, determined to be free, while Julia Grant marries Lt. Ulysses S. Grant, a staunch abolitionists from Ohio, who would rise through the ranks of the Union army during the Civil War and become President of the United States. Visiting her husband on battlefields, Julia took Jule with her as a slave behind federal lines until the signing of the Emancipation Proclamation inspired Jule to escape and claim freedom. Chiaverini is the author of “Mrs. Lincoln’s Dressmaker,” “The Spymistress,” “Mrs. Lincoln’s Rival,” and 20 volumes in the Elm Creek Quilts series. “I first became intrigued by Julia Dent Grant when I was researching the wartime experiences of Mary Todd Lincoln for my novel, ‘Mrs. Lincoln’s Dressmaker,'” Chiaverini said. They met in March 1865 and Mary had a “very public meltdown” and “accused Julia of wanting the White House for herself,” Chiaverini said. She drew upon memoirs, period newspapers, journals and other sources for her research. During her research, she discovered Julia lived with Ulysses Grant at military headquarters, joining him when it was safe and brought “her favorite slave” along, Chiaverini said. “I was absolutely astonished by the utter incongruity–from my modern perspective, at least–of a Union general’s wife owning a slave,” Chiaverini said. She wrote “Mrs. Grant and Madame Jule” in part to satisfy her curiosity about Jule, she said. But she found few details about Jule, and most of her personal story is fictional. Chiaverini said she always wanted to be a writer and finished her first novel in 1997, which was published in 1999. Although Chiaverini lives in Wisconsin, she was born in Cincinnati and said it is a point of pride so many important figures from the Civil War were from Ohio. “What I love about writing historical fiction, is I can delve into the lives of all these people we know but we don’t know enough about,” she said. Chiaverini has always loved writing and the day she could do it for a living, she considered herself a success. Aspiring writers need to summon up the courage and write. Today through social media, there are more avenues for writing and being read, she added. “No one can make you stop except you,” she said. Her next book is inspired by the poem “Christmas Bells” by Henry Wadsworth Longfellow written during the Civil War. Copies of “Mrs. Grant and Madame Jule” will be available for purchase and signing courtesy of the Learned Owl Book Shop. Refreshments will be served following the program. Cuyahoga Valley. — The blue heron has returned to the Cuyahoga Valley to build nests and raise its young this summer. Visitors can join Summit Metro Parks interpretive naturalist David Brumfield April 12 between 1 and 3 p.m. to learn about the blue herons at the viewing area on Bath Road Heronry, between Riverview and Akron Peninsula roads. Brumfield said he would have binoculars and spotting scopes set up for viewing the largest heron in North America. The birds can reach 4 feet tall, weigh about 4 pounds and have a wingspan nearly 7 feet across. The male herons returned to the Cuyahoga Valley area in February to choose a nest, and they offer sticks to the females when they return in March as part of the courtship, Brumfield said. After laying three to seven eggs, depending on the food available, the pair takes turn incubating the eggs and caring for the young. Gestation is 28 days with the birds hatching in late April or early May, Brumfield said. The birds stay in the nest until early July. Then the birds abandon the nests, spending the daytime looking for food and roosting in trees at night. The herons prefer sycamore trees, which are found in wet areas. One of the major trees on Bath Road contained 44 nests fell last year, Brumfield said. Those birds built nests on the north side of the road with 25 nests on the west bank of the Cuyahoga River and 21 nests on the east side of the river. About 104 fledglings were born in the new nests on the north side with a total of 277 fledglings for both nesting areas in 2014. Herons can be spotted standing in shallow water, waiting to strike their prey of fish, amphibians or aquatic invertebrates, he said. The blue heron has been nesting in the Bath Road area for nearly 20 years, Brumfield said. This was one of the questions: What does your writing space look like? 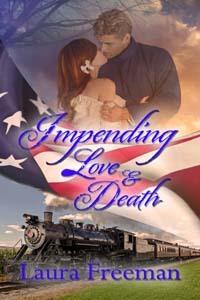 Read the interview at http://wp.me/p5qJdq-h8 and comment to win a chance until April 25, 2015, at an ebook copy of “Impending Love and War,” a historical romance novel by Laura Freeman.